Hi everyone, and welcome to the March issue of the Shanville Monthly!! It's a short one this month -- things have been quiet in the run-up to the release of Ocean of Blood at the end of April -- the calm before the storm!!! But there's an amusing, TV soap-related related item, and very good news for fans hoping to catch me on tour -- I've added another day to the Irish leg of my May tour, as well as another day to my events in Australia, in Adelaide. You can find out all the latest tour info below (I've updated the details since last month), along with all of the other news items. 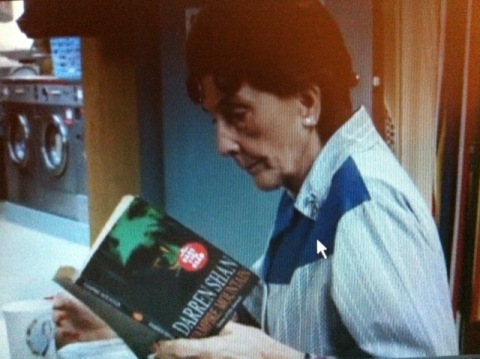 On the UK TV show, Eastenders, on February 24th, Dot Cotton was spotted reading “Vampire Mountain”!!!! For those who don’t watch the show, Dot is one of its most famous characters, a national institution by this stage, so lots of fans of my books were VERY excited to find out that she was a closet Shanster!!! It just proves what I’ve always said—you’re never too old to be a fan of Darren Shan!!!! If you live in the UK, you can maybe still catch the clip on BBC iplayer: http://www.bbc.co.uk/iplayer/episode/b00yz5k4/EastEnders_24_02_2011/ It appears at the 15mins 55seconds mark. And I’m attaching a photo of it below, just in case anyone is in doubt!! I had a hugely enjoyable first event of the year in Surrey late in February. It was held in a great location (Bourne Hall) and we had a full house. I read out a world-exlusive extract from book 2, along with a couple of other favourite readings of mine... answered lots of questions... and signed LOADS of books for two and a half hours -- sweet!!! It was the perfect start to my touring year, and has set the standard for 2011!!!! 11.00am -- public signing, Easons Newbridge, County Kildare. This is a bank holiday Monday. 3.00pm -- public signing, Easons Dundrum, Dublin. This is a bank holiday Monday. 10.30am -- multi-schools event, Catton Grove Junior School, Norwich. 6.00pm -- public event in Jarrolds Department Store, Norwich. 6.00pm -- public event, Shire Hall, High Street, Chelmsford, arranged by Just Imagine book shop, New London Road, Chelmsford. 10.30am -- public event, Attlee Room, Haileybury College, Hertford Heath, Hetrford SG13 7NU, arranged by Books @ Hoddesdon, 79 High Street, Hoddesdon, Hertfordshire EN11 8TL - phone 01992 442290 for tickets. 6.00pm -- public event in Cardiff -- details TBC. 10.30am -- multi-schools event, Liberty Hall, Dublin. Part of the Dublin Writers Festival.